It has been a busy year for me and I’m really starting to feel it. But it’s been a great year. I’ve been neglecting you guys. Sorry about that. So let me bring you up to date on what’s up with Deatri. From July 2011-July 2012 I released the traditional romance series Write Brothers. I can not thank you enough for the LOVE and support you all have given me for that series. Third Time’s A Charm and Tease will be out in print SOOOON. I am currently writing Tex and Gloria’s story (the Write Brothers’ parents) and hope to have it out around Christmas. Click here for links to the titles and to view the virtual tour. Being traditional romance, the Write Brothers series were shorter titles. Well, guess what. 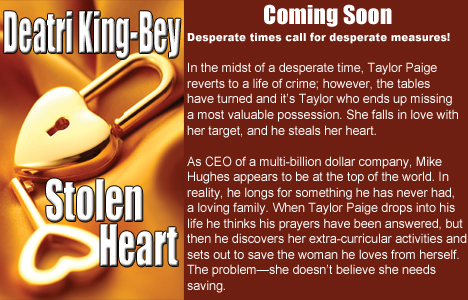 My next title is a full length contemporary romance and will be out early October. Here’s the non-edited sample. I moved my Black Romance and Women’s Fiction bookclub from Shelfari over to Facebook. We have a lot more activity since the move. I held off on moving over for years because I feared the group becoming a billboard, but that didn’t happen. We talk books and so much more. If you haven’t joined us, come on by and hang out with us. The guidelines for the group are in the about section of the group page. We follow the guidelines. I read a LOT. Believe it or not, most of what I read is not romance or women’s fiction (shhhh, that will be our secret). I along with many others, have had a difficult time finding Black authors of suspense, thrillers, mystery, sci-fi, horror, paranormal, so decided to do something about it. I know these authors are out there, so I’m on a quest to find them and place their information on one website for other readers of the genres, like myself, to find them more easily. Visit http://www.ReadingInBlack.com, sign up for the newsletter (max once a month) and join us on Facebook. Our current event is Six Weeks Of Reading In Black where we are examining each the groups genres a week at a time. We’ve been having a BALL. This week we are exploring Mysteries. Come on by our Facebook page and join in the fun. Unfortunately, I will not be in attendance physically at the conference this year. I’m headed to Europe for my 25th wedding anniversary and my youngest graduates from North Western in June, so I can’t make it to the Slam Jam. But you’d best believe I will be there in spirit! For those of you who don’t know about the Slam Jam, it is THE place for readers and authors of Black romance and women’s fiction. Do not miss this conference. http://www.romanceslamjam.org. Well, that’s it for now. Don’t be a stranger! Until next time, much joy peace and love.